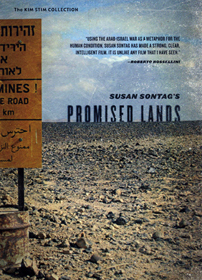 Promised Lands is famed writer and critic Susan Sontag's sole documentary project (and her third directorial effort), shot in Israel on the fly in the final days and immediate aftermath of the 1973 Yom Kippur War. Not only does the film scrutinize the ongoing Arab-Israeli conflict, but it also brilliantly underscores the deepening divisions within Jewish thought over the very question of Palestinian sovereignty as well. Banned by Israeli authorities upon its initial release, this visually visceral portrait of a land torn apart by the competing values of militarism, consumerism, and religious national identity is as prescient and thought provoking as ever.